Scientifically formulated to help manage provide maximum benefits. Gout-Relief TM is a natural supplement that uses only the highest quality herbal, mineral, and vitamin ingredients available. And Gout-Relief does all this without the high risk of side effects associated with prescription drugs. “ Western Herbal is one of the few business’s that I have dealth with that offers a product that actually achieves the promotions. I have recommended Gout Relief to numerous patients with exceptional results. Not only did the product work, it worked quickly and for anyone that has suffered from Gout, time is of the essence when pain is involved. The product labeling is clear, concise and the product contains the perfect proprietary blend to be effective. We invite you to try Gout-Relief completely risk free for 90 days. You may return the product within 90 days of the purchase. Please Note: Shipping and handling charges are non-refundable. Please review our Return Policy for full details. Gout-Relief is natural and completely safe! As with all of our products, Gout-Relief is produced in an FDA certified laboratory, meeting the highest industry standards in the production of each and every bottle. Each product meets or exceeds the standards and requirements set forth in the FDA’s Code of Federal Regulation (21 CFR, 111) Current Good Manufacturing Practices (CGMP). Gout-Relief has no reported side effects or drug interactions, and does not include any caffeine or ephedrine. Your gout may flare up when you start taking Gout-Relief. This may be due to crystals beginning to dissolve in your joints as your uric acid level goes down. Be sure to take Gout-Relief as recommended, every day – with food. Your healthcare professional may tell you to take other medicines to help prevent or manage flares during initial treatment. For Immediate Relief: Take (2) tablets (3) times daily until symptoms of pain and swelling are gone. Once these symptoms have receded, it is recommended that you take (2 or 3) tablets daily to control uric acid levels and subsequent attacks. For Ongoing Support: Take (2-3) tablets daily with meals, or take advantage of our Gout Cleanse Combo for a comprehensive long-term solution. An extract of pineapple, bromelain has been found to have anti-inflammatory and analgesic (pain-killing) properties. It is also well known as a digestive aid. Bromelian also enhances the bodies ability to absorb the remaining Gout-Relief ingredients. Potential risks: Anyone suffering with peptic ulcers should not use products containing bromelain. People with digestive disorders should consult a doctor before using bromelain. Black cherry contains flavanoids and beneficial tannins and has shown to be extremely effective against gout and related symptoms by helping to metabolize and neutralize uric acid. Pantothenic Acid is a B vitamin (B-5) used by the body’s adrenal glands to create steroid hormones. It is essential to the production of important components of connective tissue and also aids in the metabolism of purines, reduces uric acid levels, and is beneficial for it’s anti-inflammatory properties. Originally used by Native Americans for urinary problems, hydrangea has been used in herbal medicine for a wide variety of urinary tract disorders. It has both antiseptic and diuretic qualities, can be very soothing to irritated tissue, and may reduce the formation of urinary stones and crystals. It can also help prevent deposits in joints and is rich in minerals needed to help build joint tissue. Celery Seed has been used in traditional medicine for centuries as a treatment for gout, kidney stones, and other kidney disorders. Well known as a liver tonic and for it’s anti-inflammatory benefits, studies have also shown that 3-n-butylpthalide, a compound found in celery, can lower the synthesis of uric acid by reducing the enzyme xanthine oxidase. White willow bark contains salicin, a compound chemically similar to aspirin. 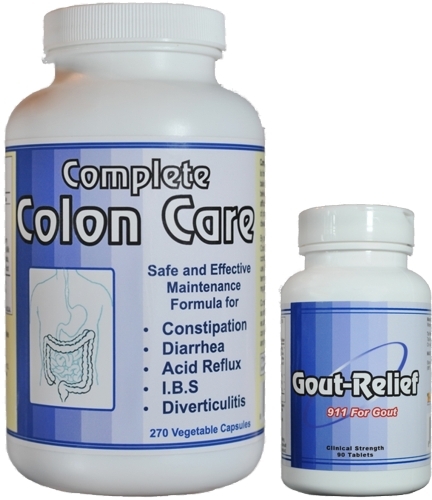 Find out how Gout Cleanse Combo can help reduce and maintain uric acid levels.